Insignia estate gets Ecoflex treatment | What Car? 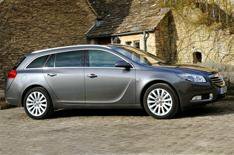 Vauxhall's Insignia estate has been given a green makeover with the introduction of Ecoflex models. The Ecoflex models have been given a range of aerodynamic tweaks, have a lower ride height than standard models and have low-rolling-resistance tyres that help lower CO2 emissions and improve fuel economy. Insignia Ecoflex cars are powered by a 158bhp 2.0-litre diesel engine with CO2 emissions of 139g/km, putting it in the 18% company car tax band. Fuel economy is an 53.7mpg on average, compared with 47.1mpg for standard cars. The green tweaks are available in Exclusiv, S, SE and Elite trim, and cost 500 more than non-Ecoflex variants. Prices start at 21,515 for the 2.0 CDTi 160 Ecoflex Exclusiv, rising to 27,750 for Ecoflex Elite Nav models. Cars are available to order now, with first customer deliveries expected next month.